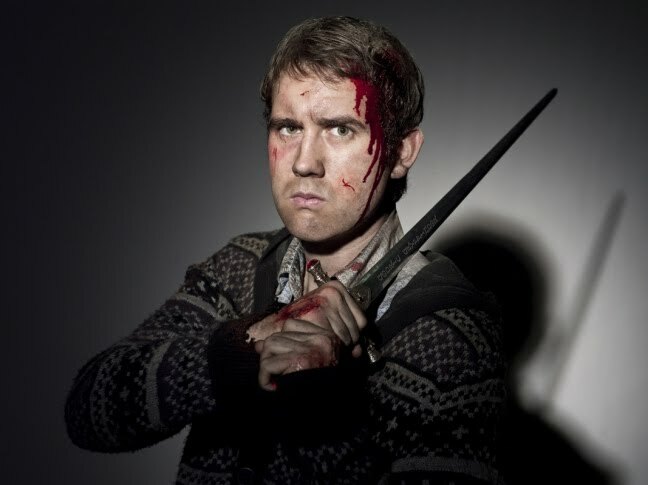 Warner Bros has released a first look photo of Matthew Lewis, one of the stars of the upcoming "Harry Potter and the Deathly Hallows Part 2," in character as Neville Longbottom with the fateful sword of Gryffindor - and he looks every bit as awesome as we imagined him. We don't want to spoil it for fans who haven't read the books (seriously, who are you people?) but let's just say that Neville will get his hero moment before the franchise is over. In an interview with SnitchSeeker, Lewis explains that the final scene of the film -- the "epilogue" if you will -- had to be re-shot because paparazzi and onlookers swarmed the cast the first time they tried to shoot it. "They were really rushed and they didn't get what they wanted," he says. "So they felt they could do it in the studio with no distractions. I spoke to David Yates recently. He's very happy in the editing room, he says. He said he's really enjoying it. So he must have everything he wants." He teases that there's a Neville scene in the final movie that wasn't in the book. "It's a new one they put in. It involves a bridge, that's all I can say. Involves a bridge and Nick Moran," he says, referencing one of the Snitchers. "It took us weeks and weeks of night shoots and stunts and all kinds of stuff. If it's all in there - I hope it's in there because it took us so bloody long to do it - and if it's all kept in there the way we did it then it's going to be amazing. That's what I'm most looking forward to."